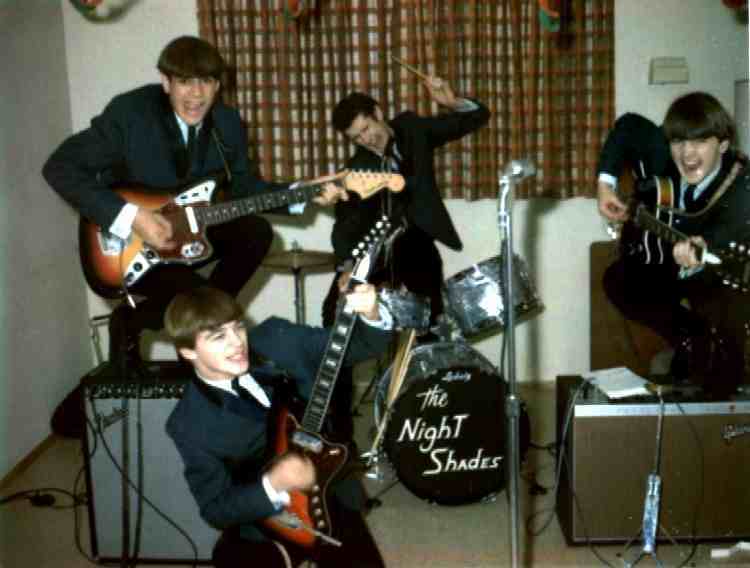 This group formed in 1963 as "The Night Shades" then changed to "The Loose Chippins" in early 1965. They lasted until mid 1967. Jack Reeves left the Night Shades and John Soltero joined the group. After Jack left, they changed their name to Loose Chippins. Kim Marin was Kevin's older brother and the leader of the band. Music changed my whole direction in life and I thank my stars it did. To make a long story very short, when the Beatles hit the music scene my Brother an I fell deep into music. We learned to play by listening to their records for days and many hours on end. We then formed our first group called " The Seekers" but soon found out that name was already being used so we changed the name to the "NightShades". After a couple of very successful years our membership changed and so did our name to the "Loose Chippin's" taken from road signs in England meaning " watch out for Rolling Rock" literally. I must sadly announce to all the groups that have websites, to all the musicians Kev played with, and also to this overall musical website that My brother, Kevin Bruce Marin, passed away on May 16, 2015, and this world will never be the same for me or any of the close friends and relatives that he touched in life, as well as music. The Seekers, the Loose Chippin's, Wind Fair, Bluebird, the Nightshades, ShadowFax, and don't forget the infamous Grand Theft and all the musicians involved will sorely miss the guy I also knew more intimately than anyone in the world as my brother, my confident, my dearest friend, my team mate, collaborator, planner, guidance counselor, arbitrator, smoother outer, but most of all my life long little brother. From the time when we played cowboys and Indians in the back yard in 1950 on Magnolia, to the time we played as the trio "Wind Fair" with Emerson Hoefs at Shilshoal Bay Marina at the "Windjammer North" with Julie Andrews in the audience, it has been a fine, fine ride for us both. A finer man I never knew and I never will. He was quite a guy in all kinds of ways, just ask anyone who knew him and you will hear words like helpful, concerned, ingenious, imaginative, cool, or just plain nice. My lifelong sidekick and partner is only gone physically. We have been so tight and so "one" for the last 65 years that this temporary separation is a drop in the bucket compared to our times together. I will deeply and very, very dearly, miss my BROTHER.